Home / Stencil Ideas / Before + After / A Design Dilemma Floored by Stencils! A Design Dilemma Floored by Stencils! Imagine this – you have older wood floors with a few stains and you’d love a cost-effective, beautiful way to fix them. 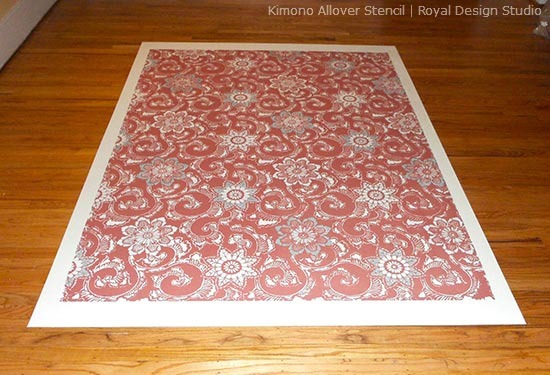 Painting and stenciling with Royal Design Studio stencils could be the solution! Portland artist and illustrator Peggy Jackson ran into this very issue recently with her dining room floors. After visiting her local Oregon Chalk Paint® decorative paint stockist, The Purple Pear, she was totally charmed by the creative possibilities that stencils and Chalk Paint® together provide. Peggy was facing a dining room floor dilemma. 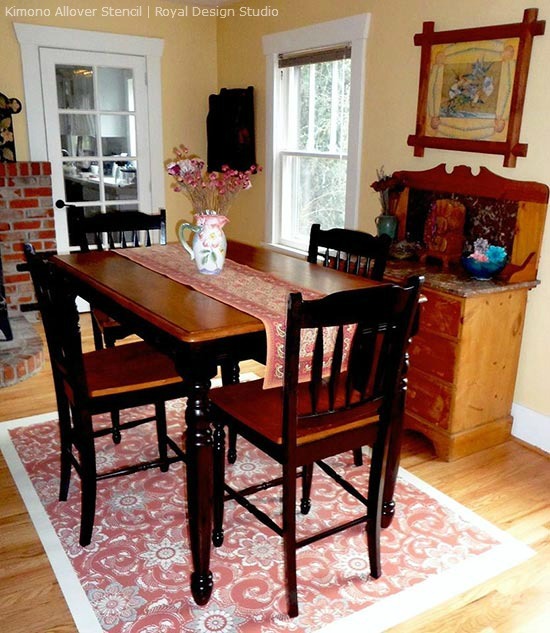 “My dogs had soiled my original area rug over time and the pattern in the rug disguised the stains. I wasn’t even aware of them until I moved the carpet!” she shares. Peggy decided to paint and stencil an “area rug” right on the wood floor in order to cover-up the stains. 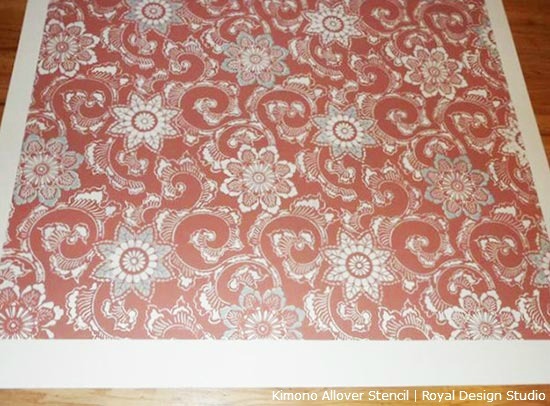 She chose our Kimono Allover Stencil from the Allover Japanese Stencils Collection. 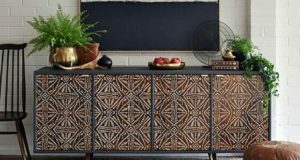 “I wanted a stencil pattern that looked like a carpet and also one that could color individual components separately,” she explains. The color palette she chose Scandinavian Pink, Old White and Duck Egg Blue Chalk Paint®. Peggy first taped out the area and painted an inner rectangle in Scandinavian Pink Chalk Paint®. 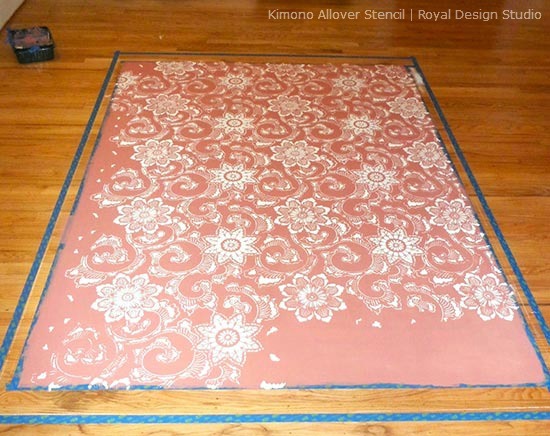 She positioned the Kimono Allover Stencil to cover the area and stenciled the allover pattern with Old White. She then highlighted every other flowered motif in Duck Egg Blue. Finally, she painted the surrounding border in Old White and since she was having her floors refinished, she had the floor contractor seal her work with four coats of a water-based topcoat. We especially love how the painted and stenciled floor rug centered perfectly under the dining room table – it literally transforms the room! “It was a fabulous solution and so easy to take care of! Stencils are key in design because you can choose your own patterns and alter the colors to fit your lifestyle,” Peggy says. She also shares that she has received many compliments on the project from her friends and she will be tackling her basement floor next. Peggy has been so inspired by the combination of stencils and Chalk Paint®, that she created a new series of mixed media paintings for her Etsy Shop, PeggitysGarden. 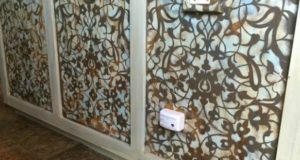 Thank you, Peggy, for graciously sharing your stenciled floor project with us. It’s always wonderful for us to see our stencil patterns used in such creative ways! 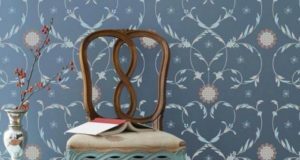 If you, too, have had a similar design dilemma with a stencil fix, let us know about it at projects@royaldesignstudio.com! 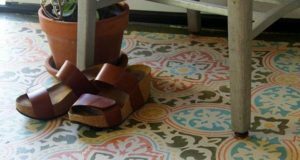 Check out these other Fab Floor Projects!